This year’s ADE will see the fifth edition of Dave Clarke’s electro-centric party ‘Whip It’ at Melkweg Amsterdam on 20 October. On the line up is Umwelt, Ultradyne, DeFeKt, Sync 24, Jensen Interceptor, Brutuzz and Alienata who will be performing back to back with Dave Clarke himself. Directly after ‘Dave Clarke Presents’ on the night of Friday 19 October - the multiple room techno event which features Sam Paganini, Rebekah and many others - the party morphs into a day time electro rave in Melkweg’s OZ room. 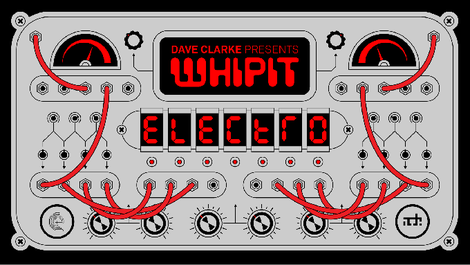 The third ADE edition of Dave Clarke Presents: Whip It starts at 07:00 through until 17:00. Adding up to a total of 19 hours of party. This Whip It sees the first ever back to back of Dave Clarke and Alienata. The Spanish-born, Berlin-based Alienata is a self-described sound obsessive, whose sets span obscure and gritty electro and techno, but the influence of idm, ebm, wave and crazy sounds in general are never far away. Frenchmen Umwelt has been active since the first underground parties and raves took place and is apparently known for his fierce, raw and analogue sound. Ultradyne has let the music do the talking for them and are rarely unmasked, which has not done them any harm in the development of a strong cult following around the world. The second live act is DeFeKT, who is a apparently ‘an advocate of true electro and techno’. He has also established a collaboration with fellow Dublin-based producer and DJ, Sunil Sharpe, under the name of Tinfoil. Sync 24 seems particularly fond of collaborations, so you'll find much of his best work in projects with artists like The Exaltics and Morphology. Completing this ADE edition is Whip It and Spacelab resident DJ Brutuzz.